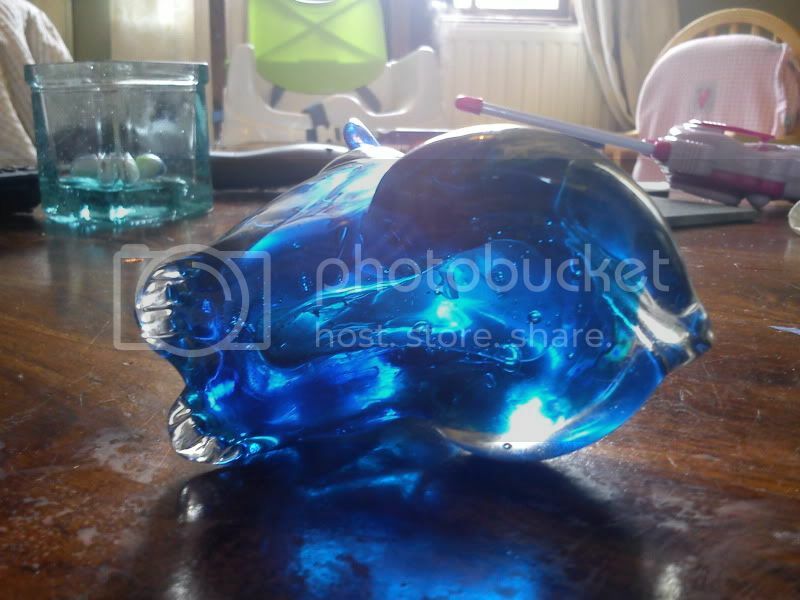 I bought a job lot of glass and found this in it. A friend said they thought it was Murano - but I guess that get's said a lot! I've google imagined my eyeballs out and found nothing like it, at least not the same. It appeals to me because it has a black nose, given the colour of the glass, this seemed an extra, almost needless but lovely detail. I haven't seen this particular dog. The eyes and general body form make me think of ICET Arte Murano of Venezuela. They make glass that is modeled on the Murano designs. I'm not sure, but ICET would be my first guess. Hi Anita and thanks for the response. 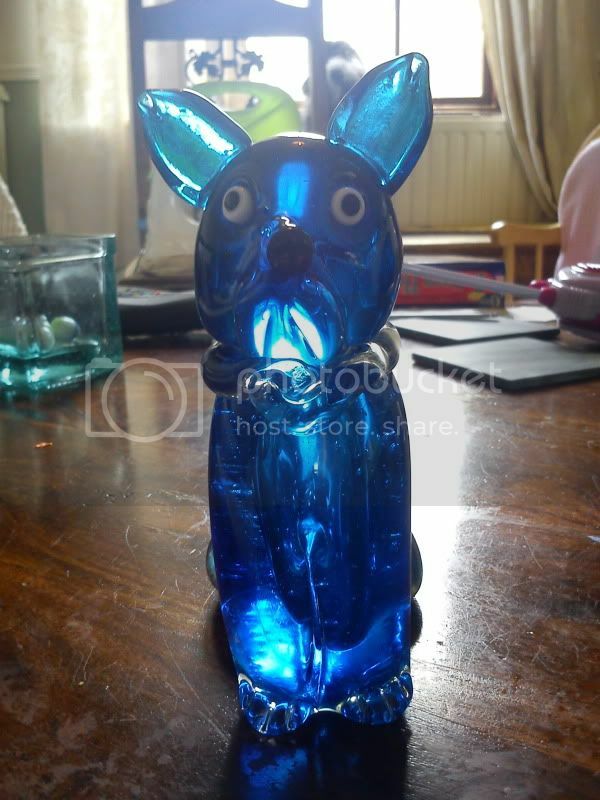 I got back late last night from an evening flea market and clickety clicked a google image search for ICET glass dog. After 10 minutes of blinding confusion over why I was getting pictures of women in hot pants and gun crime I realised that google doesn't know ICET from Ice-T, the rapper! Adding Murano brought up another hound from here and a few more transparent results between the rapper's harem - still no pooch quite like mine though. 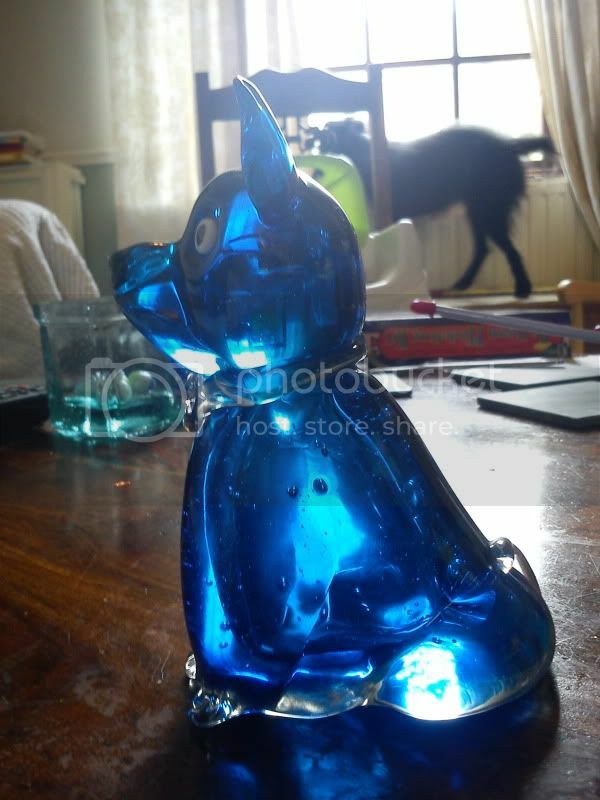 I gave up and gave in to the remains of a bottle of red wine, my odd blue dog on the mantelpiece looking at me with his surprised expression (like someone is taking his temperature!) and very sweet doggy nose. I think he might stay, at the very least till I know enough to swing him a real home.